As the summer draws to a close and schools starting back in the next few days, hopefully all our members will be back to running on Monday and Wednesday night at 7pm. It will be great to catch up with everyone again and pick our challenges for the months ahead. With some members taking a well earned rest, others have been busy taking part in the various races around the County and further afield. It was especially rewarding to see some of our newer members Elaine, Sarah Jane and Rachel run in the 5k in the new nature park earlier in the summer and also well done to Siobhan, Jackie, Tracy and Laura who ran the Island 5k last week. 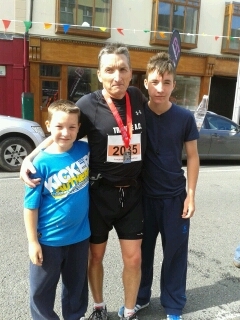 PJ McCarthy continues on his mission to "run the alphabet" and today completed the Longford Half Maraton in a very impressive 1 hour 35 mins finishing 43rd overall and 6th in his age category. Next Wednesday the 29th August there is a 10k fun run in Tramore organised by Boots Chemist. It starts as 7pm at the Racecourse and finishes outside the Majestic, entry fee €10, all proceeds going to charity. Registration is from 6pm. As we usually run at 7pm on a Wednesday night, it would be good if some of our members could take part in this run. Next Friday the 31st August the 5 mile Genzyne Road Race in aid of MS Ireland take place at 7.30pm starting and ending at Genzyme. Entry fee is €12 and you can register on Run Ireland up to Thursday or €15 on the night.